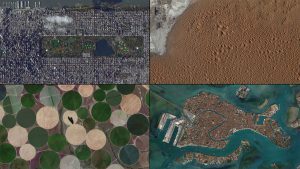 If you like aerial photography, you will be sure to like this photo feature from The Atlantic magazine showing a series of images, all at the same scale, showing patches of the earth that are seven square miles big each. The array of different topographies is amazing! You can see the images here. Be sure to look at it in full screen if you can. Not much in the way of weather, but cool nonetheless.